Thai food generally can be quite self explanatory in terms of you can see exactly what the main components of the dish are. Often at a food stall selling a selection of curries and stir-fries you can tell which ones have vegetables, which ones might be chicken, sometimes you can tell which ones have fish – it is least obvious how spicy a dish will be, but you can have a guess (and then see how close you were). It is not quite the same with Thai sweets – you can generally guarantee that it is going to be very very sweet, but other than that you might not be able to tell what it’s made of. 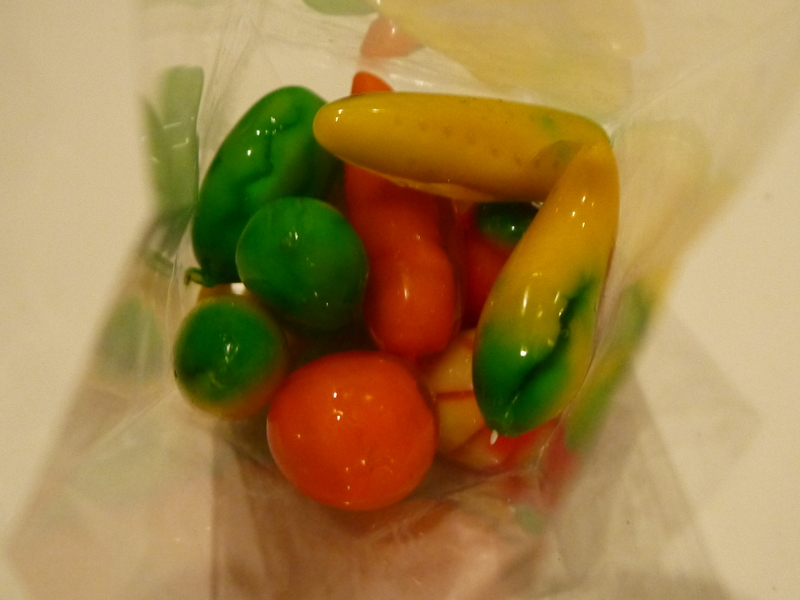 Case in point – this cute fruit shaped candy. My assumption had been that they would be fruit flavoured but on munching into them I was surprised to discover they were not fruit flavoured at all, but a sweet mung bean paste coated in coloured gelatine. Known in Thai as Look Chup. There were interesting to eat, although I didn’t enjoy them that much – partly because I was disappointed they weren’t fruit flavoured, and partly because the soft and mushy texture was off putting. Before saying I don’t like them I think I’ll have to try them again. I think on a second attempt being full aware of what they are I might enjoy them more.